Watch the highlights of the Philippine Azkals vs North Korea last March 29, 2016 at the Rizal Memorial Stadium, Manila, Philippines. It was a great game for the both of team. 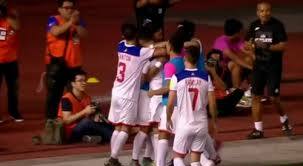 The Philippine Azkals who's been in a 4 consecutive losses comeback and win the game against the Top North Korean team. Bahadoran scores first for the Azkals at the 44' but the Korean comes back with their own from So Kyong-Jin at 45+ and Ri Hyok-Choi at 48'. The Korean team got the game and there is only 10 minutes left in the game. But Azkals Ott scores at 84' and followed by Ramsay at 90' to win the game with the score of 3 for the Philippines and 2 for the North Korea. The FIFA World Cup 2018 qualification for Azkals are done and they didn't make it but they have a big chance to qualify for the AFC Asian Cup 2019. Azkals Next game is on September 16, 2016, against Kyrgyzstan in Bishkek, Kyrgyzstan for a Friendly game.